Grow Easily and Organically without Straining Your Back Aromatic red cedar is naturally resistant to weather, rot and insects, making this easy-to-assemble elevated garden bed a hardy choice. It's a great for organic gardening because no chemical treatment is used. Better yet, it's specially designed so you don't have to bend down to the ground, so it's easier on your back.Almost 3 ft tall! 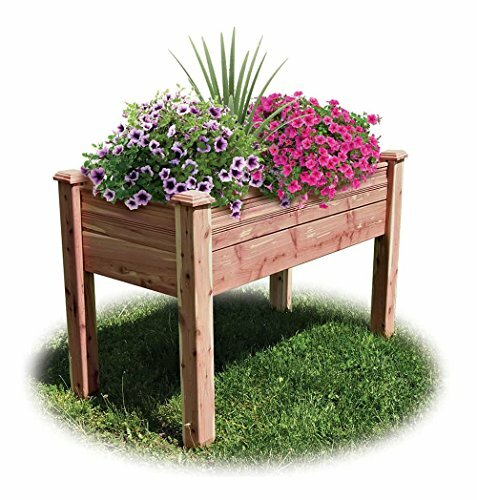 A great solution for folks who unable to get down and work at lower levels Grow vegetables, flowers and herbs 24" depth enable you to comfortably work from one side Corner posts with rounded edges and tapered feet Holds 4.6 cu ft of soil Naturally weathers to a grayish color Dimensions: 48"L x 24"D x 32"H Weight: 54 lb USA made Note: Some assembly required. If you have any questions about this product by CLASSIC BALUSTER LLC, contact us by completing and submitting the form below. If you are looking for a specif part number, please include it with your message.